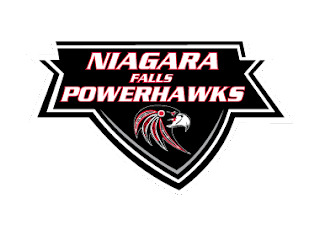 The Niagara Falls PowerHawks earned 4 of six points over a split weekend of three games with the Skylands Kings and Oswego Stampede. The PowerHawks split a pair of games Saturday and Sunday against the Skylands Kings in New Jersey, with a 5-4 win Friday and a 4-1 loss on Sunday. Niagara Falls followed up Tuesday evening with a 4-2 victory over the Stampede in Oswego. In Saturday’s matchup, Niagara Falls opened the scoring with the single goal of the first period. Scored by Brandon Schweickert and assisted by Branden Tripi and Evan Domiano, the goal came at 6:00 of that frame. The PowerHawks extended their lead 7:22 into the second period with an unassisted tally by Michael Olszewski. Kurt Villani made it 3-0 at 11:29, assisted by Spencer Hrynczak and George French. Skylands finally got on the board with three straight goals in the third to tie the game. Eric Vanderhoff got it started for the Kings with a goal at 15:23. Craig Garrigan assisted. Lionel Landry drew Skylands to within a goal with his own marker at 16:33. Stephen Finkel and Stephan Sizov were credited with the assists. Garrigan tied the game at 18:46 with an assist from Steven Ford. Niagara Falls found their scoring touch early in the third period. Gage Mueller broke the tie only 1:56 into the period. The goal was unassisted. Spencer Hrynczak made it 5-3 at 7:38. Kurt Villani and Schweickert assisted. Skylands scored a goal to make it 5-4 with only 39 seconds left in the game. The power play goal was scored by Finkel with assists by Garrigan and Vanderhoff. Josh Mitchell was able to turn away 25 of 29 shots faced while picking up the win for the PowerHawks. Mathias Yettereng stopped 35 of 40 shots for the Kings. On Sunday, the Skylands Kings bounced back. Garrigan opened the scoring at 7:00. Vanderhoff and Stephan Sizov assisted. Craig Scarpa scored for the Kings at 18:24 with Steven Gay assisting. Skylands carried a 2-0 lead into the first intermission. Niagara Falls scored the only goal of the second period, and their only goal of the game, off the stick of Evan Domiano. Brandon Schweickert and Nathan Walerowicz were credited with the assists. The third period was all Skylands as they scored another pair of goals on the way to the 4-1 victory. Andrey Yakovlev scored at 12:11. Garrigan and Vanderhoff assisted. Vanderhoff scored his own goal into the empty net as time expired. Mathias Yettereng turned away 48 of 49 in the win for the Kings. Josh Mitchell made 25 saves on 29 shots for the PowerHawks. The PowerHawks travelled to Oswego for a Tuesday night tilt against the Owsego Stampede, skating away with a 4-2 victory. Michael Olszewski scored both goals for the PowerHawks in the first period. His first goal came at 4:42 with assists by Frankie Bodami and Stephen Minichiello. His second came at 15:10. The assists were credited to George French and Bodami. Branden Tripi extended the Niagara Falls lead to 3-0 at 8:18 of the second period. The power play marker was assisted by Brandon Schweickert and Bodami. Oswego notched their first goal at 9:02 when Jameson Simmonds put the puck in the back of the net. Jared Berry and Rich Hart were credited with the assists. Evan Domiano responded for the PowerHawks at 18:08. Mitch Thornton provided the assist. Oswego scored the lone goal of the third period when Simmonds scored his second of the night at 14:45. Marcos Zarragoitia and Josh Wallace assisted on the goal. Kris Augustine made 30 saves on 32 shots in the win for the PowerHawks. Steven Kozikoski turned away 39 of 43 shots thrown at him for the Stampede. The Niagara Falls PowerHawks will play their final game of the regular season Friday evening in Rochester as they face off against the Roc City Royals. Game time is set for 8:30pm at the Lakeshore Hockey Arena.